As we've already said, the selections for Mattel's first Batman line are ridiculously asinine. Stuck in a 1980s mindset, the only thing that keeps Mattel from becoming a respectable name in the toy industry is Mattel itself. Out of six figures in their first series of Batman figures, four were of the Dark Knight himself and only one of those was in anything resembling a normal costume. 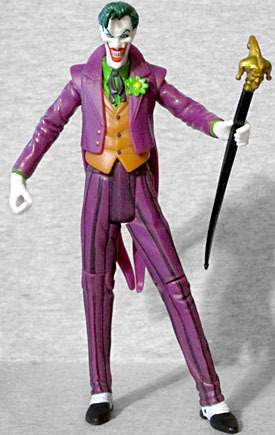 Fortunately, one of the two remaining spots in the assortment went to a villain for Batman to fight: the twisted Joker. Like light and dark, Batman and the Joker define one another. It's a yin-yang relationship that has been explored often in the comics, but it's very true. Batman's world is cold and ordered, while the Joker brings with him raging chaos. So if you're only going to give Batman one badguy to face (and you know Mattel is), Joker's the one to choose. 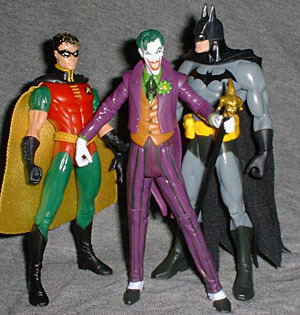 If the best Batman figure, "Zipline Batman" was shortpacked, then Joker must be dwarfpacked - early shipments had three each of the variants, two Ziplines and one Robin or one Joker. That's just idiotic, and Mattel should have known better. As sculpted by the Four Horsemen, Joker is a gaunt little freak who obviously could never beat Batman in a straightforward fight - instead of meaty old Jack Nicholson, think Crispin Glover. He's got the look of a satanic carnival barker, relying on his warped charisma to get him to his goals, and the toy looks awesome for it. 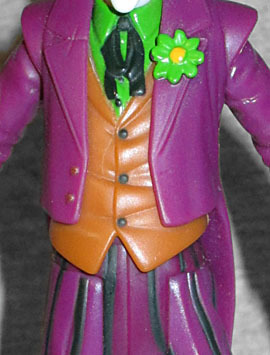 The Joker is wearing an update of his traditional outfit: pin-striped purple pants and waistcoat, an orange vest, green shirt and a black bowtie. He's even got his acid-squirting flower on his lapel. Though the colors are the same, the cut of the clothes are a bit more exaggerated than before. He's got a weird stance, with one hip cocked to the side, that doesn't look particularly threatening or even very stable - if anything, it looks somewhat effeminate, though not enough to be any sort of challenge to Batman's over-assured masculinity. One shortcoming this figure does have, and we use that word literally, is its height. Standing less than 6" tall, Joker is just a bit shorter than Batman. Now, that could be fine, if it was intentional; however, just like Ice Armor He-Man's axe accessory, this is a screw-up that happened after it left the Horsemen's hands and got to Mattel. 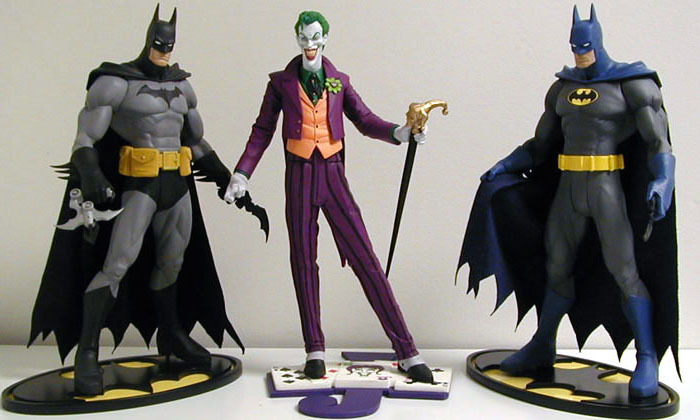 Originally sculpted to be just a bit taller than Batman (and while you're looking at that picture, check out the cool bases and decent accessories we could have gotten), the Joker's added height would have made him more of a threatening presence. However, he got scaled down in the tooling process, and now is just barely taller than the teenaged Robin. Plus, detail that would have shown up in a slightly larger figure is now lost due to size issues. Rather than looking like a credible threat, he looks like an undersized, over-matched joke; his entire body is now too small for the line. 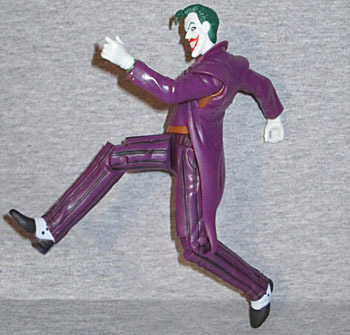 Joker has the same underwhelming articulation that has become Mattel's trademark: neck, shoulders, wrists, waist, hips and knees. Even the paint job seems like an afterthought: why bother painting Joker's face or hands if they can just be molded from white plastic? Who cares if that means the details present in the sculpt don't show up on the toy? We're only selling these to 5-year-olds; it's not like anyone has been waiting years for a good line of Batman figures. The Joker's accessories are sort of a mixed bag. The highlight is the "joker's head" cane that has been adopted from the comics, though safety standards have it molded from a soft plastic that is entirely too flexible. 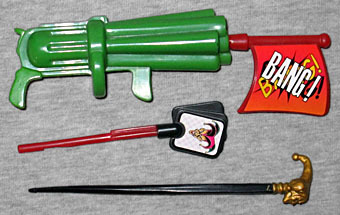 He also has a comically distorted green gun that can fire one of two included projectiles: a "Bang" flag or a handful of playing cards, though the cards would be better as a separate item. The weapon - oversized and distorted and lime-green - was obviously designed to look nothing like what it is: a gun. This is nothing more than an appeasement for the dinosaur-brained few who think that giving children a realistic gun to play with will make them more violent. While this policy of unreality works in the Joker's case, since he'd be likely to carry such an outlandish item, it won't work for more (comparatively) down-to-earth criminals like Two-Face, so let's hope Mattel actually grows up a little before we see Harvey Dent on store shelves. Of course, expecting anything above a third-grade mentality might be a little bit too much to ask from the company that has given us so many colossal blunders in its recent history.